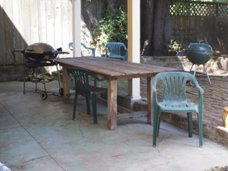 FOGBELT STUDIO, a non-toxic workplace, is located in the Sunset-Parkside (south - west) neighborhood of San Francisco. In 1927 when the house was built, this space was a 3 car garage. 32 X 48 inch bed, used for printing monotypes, collographs, linoleum blocks and etching plates - wonderful 60 year old manual press! 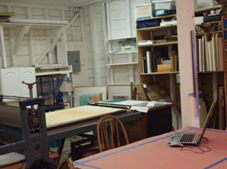 There is also a low sturdy table, seats 4, with a large paper cutter on one end. There is a separate small dark room with large UV exposure unit for cyanotypes, deep utility sink, and small refrigerator. The FOGBELT "lending library" outside the dark room (coffee & tea - no charge) houses shelves of books on artists and techniques to sign out, and old copies of art related magazines to take and keep. The adjacent family room, tables & microwave, is used for classes and coffee breaks. The patio outside is useful for papermaking and cyanotypes. 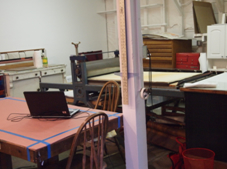 FOGBELT has held all ages and stages of art making from the beginner taking a basic class, to the experienced printmaker renting the studio, preparing work for an upcoming show. Some folks come weekly, some occasionally, to work on a project too messy or too large for their own household - having the whole studio to themselves for an entire day - or as a small group of friends getting together monthly to do collage. 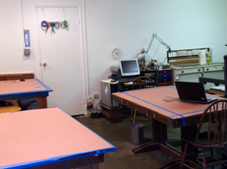 Artists have rented the space to teach their own classes in various mediums. Contact me to view the studio, to discuss your plans and needs.